Nuevo Leon, Mexico’s industrial heart. We have seen much activity from FINSA. We have read FINSA’s large activity in Queretaro lately. You have very ambitious projects we will analyze later on, but, in the industrial park niche, how would you evaluate the sector? I would go from the macro to the micro and describe to you what FINSA is doing as a company. We have been operating in Mexico for 37 years and we have only dedicated our work to industrial development, industrial parks development, to the promotion of Mexico. We started in the border, we grew along the border region and we eventually we integrated to the most important cities in the interior of the Republic, as infrastructure improved. But we always sought the development of a product close to what the Americans or foreigners were used to seeing in their countries, especially in the US. We have already developed 16 industrial parks. Not only did we develop industrial parks but we integrated it to the development or construction of industrial buildings. And we have been able to build approximately 7 million square meters in the Mexican Republic. Our strategy has always been to produce something honorable for the production or for the people working there. In the US we were categorized as suppliers of second level products, not with the quality they were used in the US. And our aim was to change that image and make world-class products, and Mexican people, working people, were very proud to work in. We have closely followed the dynamics of the sector. The sector has had a 20 to 25% annual growth, the textile industry or the manufacturing industry since the 70s, 80s, 90s and it has not changed. Mexico, as you mentioned before, still receives foreign investment, a lot, especially in the automotive, aerospace and logistics sectors. And we are determined to continue addressing that, right? In the case of Nuevo Leon, well, its clients’ diversification, the client typology is diversified. Completely diversified, the automotive prevails by nature and by the growth of our industry. The automotive sector has been for 20 years the engine of Mexican industrialization. It still is, we still receive foreign investment related to the automotive sector and our company has lined up with that sector now. We are diversified but 50% of our activity is automotive. We can open a chapter for aerospace. It seems a flashy new industry for the Mexican scene. How did you get involved in this field? We have worked together with several aerospace companies and we have to continue doing so, especially with the European ones that have been arriving, like Eurocopters. The Canadian Bombardier and others, and they have established themselves in the interior of Mexico. Queretaro, Chihuahua has some, Monterrey has also made an effort to attract investment in the aerospace industry. Going back to Nuevo Leon. It still has the attraction capacity in that industrial park niche. We have also had the opportunity to talk to people in the Interpuerto project, so they are still betting on that model. In that sense, we have mentioned we saw FINSA’s great activity in Queretaro, and what can you say about what you are doing in Nuevo Leon that is worth mentioning. Nuevo Leon still is a very important market for us. The Bajio, I would not call it Queretaro, it is The Bajio general area, that is where most of the activity is, for example, Mazda, Toyota, well not Toyota but Honda, and Chrysler, and GM with its plant, its new plant in Silao and of course Nissan’s announcement of a new plant in Aguascalientes. All that area, that interior strip is the so called The Bajio area. Last year you became a CKD, also involving the Retirement Funds Administrators which is a way of taking care of a country’s domestic savings, what else is there for you to do? We should follow closely what markets require always using the most viable and economic options to access financial markets. In the 80s, and you mentioned our first placement, we did it in 1987, we issued exchanged debt when it was possible to do so. First we got in the market with the federal government. They authorized us to create an innovative product. As park builders, as developers of industrial parks, we needed to build inventory buildings, what we call speculative buildings to the attention of the market or the industry. At that time many industrial people in Mexico were buying debt and the government recovered it, they gave it to the government and the government itself gave them a discount for the recovery and paid that debt with a differential. We went to the government. We told them well let us use that part of the debt to build and speculate, not speculate but to make my inventory products, which are so much needed in the textile sector. They gave us the chance to discount. We discounted a good amount of Debt-to-Equity Swap. We were the first ones in Mexico and that allowed us to expand our business niche. In 1999 or 2000 we had to look for another financing method besides the traditional debt one, and well we had the chance to make this placement and also a primary placement in international markets. We made our deal and sold 38% of our company to investors. It was also primary with the intention of issuing, and finding ways of capitalizing the company and growing with that demand we saw and that still exists in the textile sector. 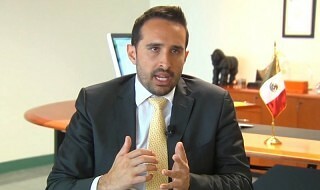 Now you have received the conclusion of the placement of 2.750 billion of pesos. I think it is quite impressive and praiseworthy that park developers, as you have mentioned, choose and boost and use thes financing options to channel this kind of sector. I would like to talk about sustainability. I think parks play an important role in the impact, of course in the creation of jobs, industrialization of the country, etc. but you also establish a frame where many industrial companies are going to start working, with a social and environmental impact. What is sustainability to FINSA? It is very important. Since the very first operations, as I told you at the beginning of the interview, we have wanted to develop something different, something well planned. So there were well-established green areas, recreational areas, and wide avenues, that a percentage of the industrial installation was respected as parking zones, with operational areas. We established regulations for each one of the parks since the very beginning, since our first design, our first park. We have always established that each park should have strict internal regulations. We do not allow street vendors. There should be a certain type of lighting and protected and security areas. We have always tried to preserve and keep green areas that are usually sold or constructed, not only respecting them but also making recreational fields. We have also built daycare centers in many industrial parks, so that people going to work, in the case of the textile industry 70% of them are women, single women, had the chance to leave their children in a protected and well-built daycare center near their work place. I can think of a thousand more questions but to sum it up we are talking about Nuevo Leon’s brand, Monterrey’s brand, a brand we want to elevate and position, how would you like Monterrey to be perceived internationally? What would you like it to be identified with? As you and your colleagues mentioned at the beginning, Monterrey has always been one of the main engines behind Mexican development. Regio industrials, local industrials, have always been seen as some of the most entrepreneurial and tenacious men. I think that if you walk around Nuevo Leon, Monterrey, you will realize the view many businessmen have, not only regarding the industrial part but also the building development part and social areas. And that will go on in Monterrey, people are committed to this area and they still believe. Unfortunately we have had bad news related to security but we have been able to overcome them. And now I think we are going through a moment of transition. And well, the one who bets on Monterrey wins. I have no doubts about it.